In his letter Deputy Director Cadet Corps for Additional Chief Secretary wrote to Registrar Chaudhary Ranbir Singh University (CRSU),Jind that i have been directed to inform you that the State Govt. has decided that the CRSU Jind shall conduct State Level Centralized Counseling for admission in B.ed. regular course for coming Academic Session 2016-17. The Chief Secretary also requested to send the prospectus for admission/counseling for session 2016-17 for approval of the State Govt.by 30.06.2016.Candidates are advised to wait the dates for admission process. 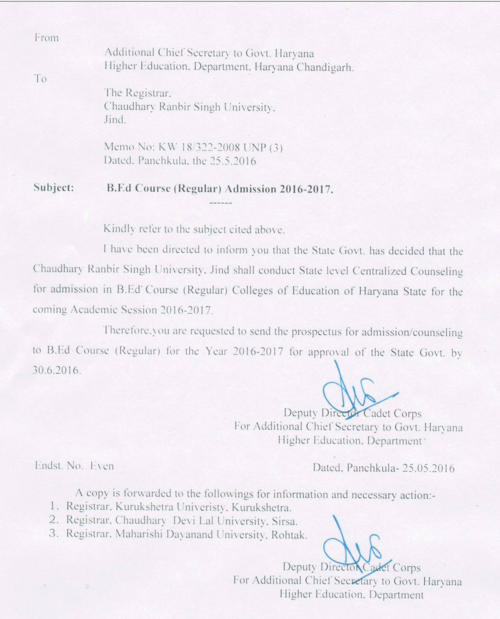 This admission process will be held for all colleges of all universities in Haryana.Like previous year,this year CRSU Jind has been declared as competent authority to make online admission in B.ed (Regular) course for academic session 2016-17.Admission schedule issued soon.Counselling will be online.Prospectus will be available on the website of CRSU Jind.